Same dogs, same clothes, same everything, almost..how's that for stability? 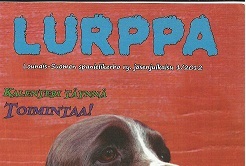 Yes, you are seeing this right...Ursus is under Rölli. Amazing how he does remind you of the Chien de Crau. Ursus di Barbochos Reiau de Prouvenco is one of the 4 purest Barbets left in the world. For more than a year now, we/ some of us, had been discussing the possibility of going to the SCC with dogs from all walks of Barbet to find out what was right or wrong with our work. Knowing that the standard was going to be modified and that we would be put in from of the "fait accompli" as in 2006 when the standard modifications were approved and rushed to the SCC and FCI, time was ticking. Just about impossible to get anyone to accept to talk about the breed itself and not feel threatened about THEIR personal breeding, there had to be a solution...as has been the case on any forum where everything degenerates, with not many or none haveing any scientif documents or having done any reasearch on 1940 1970 and beyond. We had one person at the club, trying to think of solutions for us, for the breed, but him being a "non" elected person he was told to take a hike, as he had no rights to expresse self. So, what to do? Go higher and ask...which is what I did and was backed up by our VP who fought tooth and nail to get the club to accept the symposium, which was not easy. I was told on that day in Lyon, that if we wanted help, the club would have to ask, and I knew that would never happen, since it never had. However, my plea was heard and the matter was discussed at the SCC weekly meeting and they apparently along with our VP, managed to convince the club to do something.Finally. That is the reason why Dr Geissant was empowered to organize the symposium.The letters are published. It is going to cost an arm and a leg and the SCC will not help financially, but it will take place and that is also the reason why you are asked to send in questions and sign up. There will not be a free for all slander session taking place, but a meeting with civilized peopel working for a breed called the Barbet. and just in case they don't get there, put Dr Geissant, VP in copy. As usual, transparence is the key word. I am also hoping that the article is written and published about hipscores, but I don't feel I can contact the person to ask him..;so wait and see. That took place on the same day and that is why you were all asked to send the info to our VP, knowing what had happened before with some forked tongues. I have compiled "his" stories of the Barbet as found on different sites, mostly club sites and when you read them there is as much diversity as there is in the breed. Had the work been done properly to save the breed and not recreate it ,after some thorough research 30 years ago, we would not be in the situation we are in today. Of course, there are still people who say concentrations camps never existed...so imagine. Ps: I am not yet finished with some "his"stories. CH-Compay II sitting in front of the kennel de Floirac, M Le Houelleur breeder and SCC judge in the 1930's. 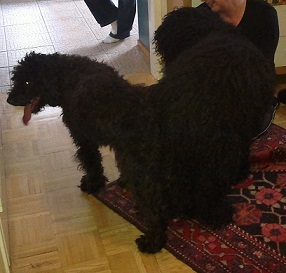 Of course you know him if you know what a Barbet is and where it came from...! 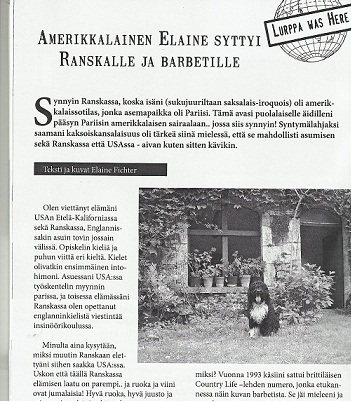 What does the French SCC do to help rare breeds such as the Barbet? So, Elaine said, "duh...I don't know." Uphill all the way, to figure out these things that some master the art of. Then, shut up...because we( who is we is still not identified, alas) know more, more what? Some of you have seen "the" letter, but not all as I have chosen not to share it except with trustworthy people referred to me. Well even that was too much as some took it and ran, pretending to not know anything and the same insults as usual happen. So, I say show me your work? Please share and not just on FB! 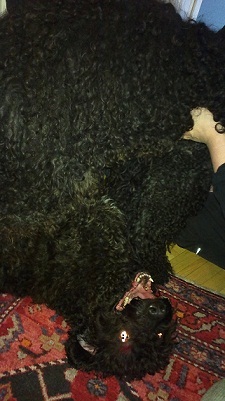 However, the Barbet is e French dog with a French standard. Said by someone else, it takes on more meaning. And after all who cares, who said it when we, and I say we, got what we wanted. BUT, that too, is life. 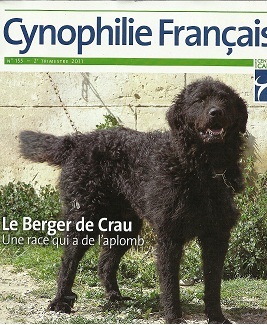 I found out that the shepherd who owned this Chien de Crau had recently died of cancer. I do remember him. Sad. That day, I started praying. Didn't know what for, then, but I started praying that at least in my lifetime, we would be able to prove that the Barbet was carefully worked on to save the breed from extinction and that the chien de Crau and the Vieux Barbet were related. Islam is coming out, and people can see it. A judge has the competences as a judge to recognize what breeds are in a given dog.It just takes sooooooo long for people to listen and accept facts. 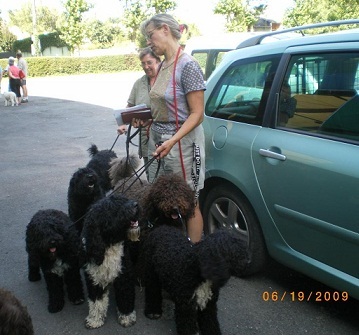 The Barbet IS a French breed and that has just been reminded to people by our breed club. Finally. Of course, there are more and more barbets in other countries, but that does not make the breed less French and as it has also been said, the breed is deviating from the standard and that is not good for such a rare breed. I have been trying so hard to get that point across and FINALLY I was heard. I did not achiever this alone because me being nobody and many making it an objective to remind me of that fact, does not make it easy. Insults and mud slinging to not hear any truths....easy to do. I say....Documenting oneself makes one more competent than school yard feuds over a dog which is dying.